WORLD electronics has made significant investment with regard to its testing and verification equipment. Completed assemblies are scrutinized for proper part placement accuracy and functionally with a variety of methods including AOI, X-ray, In-Circuit Testing and functional testing. Functional testing is an ad hoc process that WORLD provides and is designed to meet the specific requirements of our clients. It is one of the most important steps during the complete manufacturing and testing process, and like other forms of testing is used to validate whether or not a particular product is suitable for shipping and free of defects. Functional testing involves ensuring that the final product functions as it was intended to do. In order to fully replicate the product’s functional environment, it will be tested through use in an identical system to that of its intended use. This means testing it within a system that includes any device that communicates with the device and has an identical power supply to the one that the device will receive. The equipment necessary can either come from WORLD’s extensive test equipment collection or be provided by the customer. Additionally, WORLD has extensive National Instruments and Lab View development capabilities to meet any custom requirement. When does functional testing take place? Functional testing takes place at the very end of the production and testing process. It is the final step in quality control, either after or in the place of other tests, depending on the time sensitivity needs of our clients. If done in addition to other methods of testing, functional testing ensures that every PCB is fully compliant with ISO standards and is guaranteed a long working life. PCBs are tested within a system similar for which it was designed, which may involve the procurement of specific equipment and devices, to fully replicate their future working environment. As a full test service provider, WORLD electronics can improve an existing test system or design new test solutions to meet a specified test strategy. 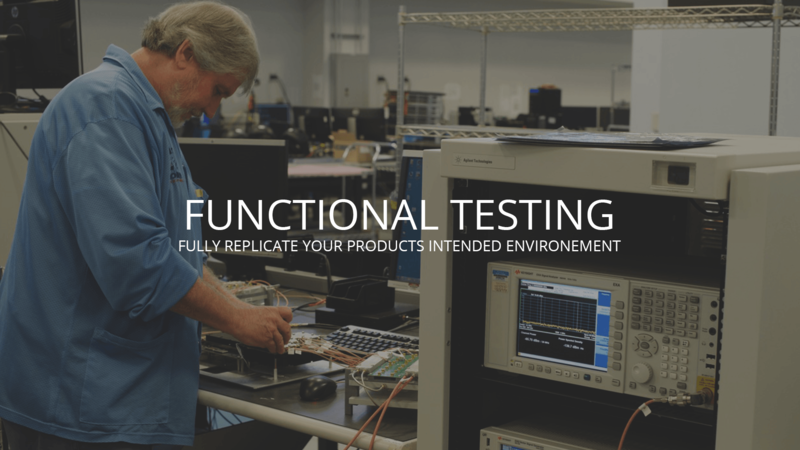 Functional test systems may include custom stand-alone systems, test firmware development, and environmental stress screening or functional burn-in racks. Our test technicians are highly skilled and will assemble and inspect to IPC 610 and J-STD-001 standards. Our production facility is frequently audited and certified to these standards. What are the benefits of functional testing? Functional testing can represent an alternative to other forms of testing, like burn-in and temperature cycling, only more closely specific as to what exactly is tested. A functional test is designed to simulate the precise environment in which our clients’ products will be operating, and as such, functional testing can be a useful alternative to other testing methods.